At KFA we believe we are blessed to be a blessing! We give in obedience to God's word concerning His tithe and our offerings. 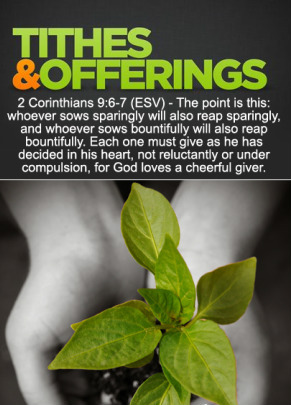 It's not a debt that we owe--it's a seed that we sow. By honoring God with what belongs to Him and being generous, Kokomo First Assembly is able to be utilized by Him as a channel of blessing that will have a life-changing Kingdom impact in Kokomo and around the world! “Today I honor God with a heart of generosity and the first fruits of my income. I believe Heaven has opened and blessings flow into my life. My faithfulness in the tithe provides protection from evil designs set against me. I believe God is giving me creative wealth-building ideas to establish His covenant of promise in all the earth. I have God's wisdom concerning business and financial matters so I can live a life free from debt and poor spending habilts. Today I sow the seed of my life anticipating blessings so I can be a blessing to many others!"